Another day, another on-the-spot snapshot analysis! 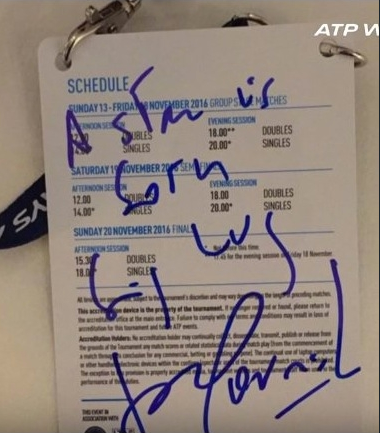 This time Jose Mourinho’s handwriting comes under the spotlight. So what does the Football Manager of Manchester United’s scrawled message say about his personality? Hamish Mackay from The Daily Mirror asked me to comment. I was given a short deadline to reveal the essence of the personality behind the written content. So I said, “Jose Mourinho is a very observant, take-charge sort of man who acts on a hunch, quickly sees the big picture and places great importance on applying the small detail. He’s an assertive decision-maker and projects his will on anyone who cares to listen, as he’s reaching for the stars. He’s individual and highly effective at problem-solving; he’s creative, imaginative and innovative – plus he gets to the root of the issue in a blink. However he’s a man who can’t be bothered with niceties or shallow small talk. He’s full of good ideas and good at sharing his thoughts with people, but only when absolutely necessary. The handwriting movements which led me to this conclusion?